So the cold hasn’t let up. I was hoping it might, but when -5 degrees C is the warm front it gets discouraging. Every morning it’s the same. Cold. And more often than not, snow. Since it looks like this icy weather might be here for a while, I decided to see if the cards had anything to say about it. Sure enough they do. 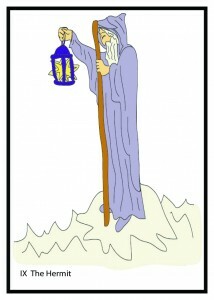 The RWS Tarot has two cards that show snow, the 5 of Disks, and #9, the Hermit. In the 5 of Disks, two people, ragged and beat up, trudge through the snow passing what might be a stained glass window of a church. They look pretty cold. The one that’s lucky enough to have shoes is on crutches. It’s a tough scene. Though I personally have a great pair of boots, a very warm parka and the most fantastic new hat anyone can imagine, I, like many others, have been feeling a bit like these two. Economically and meteorologically challenged. How the heck are we going to get through this winter? The cards’ advice – Get inside! Just joking, but not really. I think the message here is to remember your spirit, that light on the other side of the stained glass window. Every season feels like winter when all you can think about is how to pay the bills and feed yourself. This card is reminding us that our energy for living actually comes from within, whatever the circumstances are. The spirit on the other side of the wall is really just our own fire. The flame inside that lets us laugh and sing even when things are tough. Hard times, aren’t enough to break us down. Only forgetting why we like living can. And then there’s the Hermit. It’s a very different feel in this image. There’s snow on the ground but the sky is clear. He’s wearing what looks like a warm hooded cloak and with all that hair on his face he hardly needs a scarf. What’s most important though is the lantern he holds in his right hand. This guy’s got his stuff together. He’s knows it’s the light that leads his way and he carries it with him wherever he goes. He’s calm, unflinching and comfortable in the snow. He internalized the lessons of the 5 of Disks a long time ago. They come in handy when the sun sets and the temperature drops. The forecast says tomorrow’s high may reach -3, with a 40 percent chance of flurries. I look forward to it. Almost balmy relative to the -14 we’re expecting Saturday. I’ll take the messages from the cards to heart and wear my new hat. It’ll be spring soon enough. 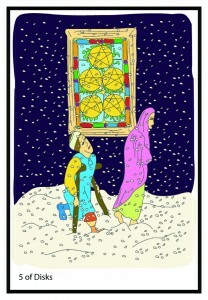 You are currently reading Snow in the Tarot at The Tarot Room.